This is an additional valve assembly to be mounted on the existing container valve. This assembly is mounted with the help of a yoke. The auxiliary container valve eliminates the possibility of leakage from the damaged container valve & the chance of gas or liquid chlorine back flowing during changing of the container. The yoke is very sturdy in construction and offers positive fixing of the auxiliary container valve or flexible copper connector with the chlorine container. The flexible copper connector is used with Cylinder, Tonner, Header and Chlorinator to form the required connection. This connector comes with a standard length of 1.5 Mtrs. with end fittings suitable for ton container valve. The silver brazing of end connectors offer a long corrosion Free service. 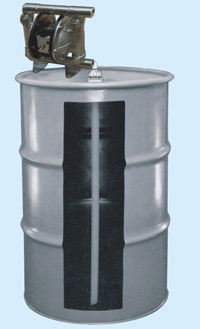 The container pressure of chlorine varies between 8 to 10 kg/cm2, which is very high to either meter or doze accurately. Hence a pressure-reducing valve is used in the system. This valve is capable of reducing the pressure of chlorine to manageable limit of approximately 2 kg/cm2. The pressure-regulating valve is spring loaded with PTFE diaphragm. This valve prevents the re liquification in the system. 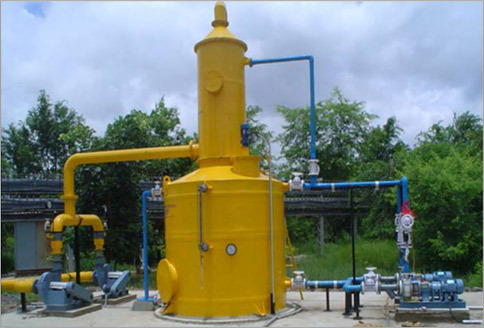 Chlorine gas filter mounted in the Chlorine gas line is one of the very important components in the Gas Chlorination system helps to eliminate the carry over of Ferric Chloride and other impurities in the system. Our Floor and Wall mounted Chlorinators are vacuum operated, solution feed type. It is designed for floor mounting or wall mounting and incorporates a filter, flush mounted chlorine pressure gauge, a reliable vacuum regulator, and an accurate flow-meter, a precise flow control valve, and effective differential regulator, an injector, and a positive non-return valve. All the components are mounted in a two-tone, gel coated attractive fiber glass cabinet. The vacuum regulator is of an exclusive design, which opens only when the vacuum is generated by the injector. On failure of water supply to the injector, the vacuum regulator closes automatically. DP (Differential Pressure) Regulators are provided only in capacities of 10 kgs/hr and above. The material of construction used for the various components of our Chlorinators are of highly resistant to chlorine, like PVC, HDPE, Teflon (PTFE), Monel and fiber glass. Our cylinder mounted chlorinators are sturdy and easy to operate and maintain. The Chlorinator can be mounted on a 65/100 kg cylinder or on a 1000 kg tonner. The mounting arrangements are different for cylinders and tonners. The injector and check valve assembly will be mounted separately near the dozing point. The interconnecting flexible pre tube is supplied as per requirements. The simple and yet advanced design of the various components reduce the maintenance of the chlorinators to a bare minimum. All the components are easily accessible from the rear of the cabinet for periodic Inspection and Maintenance. Our Chlorinators are pre-assembled and is fully tested under simulated operating condition. This saves time and money during installation and helps towards a smooth start-up. Water passes through the injector to produce vacuum. This vacuum opens the check valve and passes through the DP regulator and extends up to the vacuum regulator. The chlorine gas under pressure from the container passes through a filter, where ferric chloride impurities are removed. The chlorine gas under pressure is converted into a constant vacuum at the vacuum regulator. The chlorine gas under vacuum passes through the flow meter, flow control valve and differential regulator before getting mixed with the water in the injector where it forms a chlorine solution. The chlorine solution is then discharged at the dosing point. Vaporizers are recommended for higher continuous chlorine gas feed rates, when it is not practical to use manifolds for the gas lines of the required number of containers. By withdrawing the chlorine as a liquid and using vaporizer, flow rates can be greatly increased. Liquid chlorine from the pressurised tonner flows to the inner chamber of the vaporizer. This chamber is immersed in a water bath, which is heated by 3 Nos. heaters. The water to the water bath is supplied via pipe which is controlled by a solenoid operated valve, which opens once the water level falls below the preset level and closes once the water reaches the higher preset level. The temperature of the water is controlled by a thermostat, which switches ON or OFF depending upon the temperature of the water bath. To protect the Heat Exchanger and Hot water tank surface exposed to water, from Galvanic Corrosion, Cathodic protection is provided by means of sacrificial carbon anodes. Chlorine Vaporizer can also be powered by steam. Steam is abundantly available in Paper & Pulp Mills, where steam is used to evaporate liquid Chlorine to form gas Chlorine. A temperature controller opens or closes a steam valve, thus maintaining a constant temperature in the steam chamber. This system is essential wherever chlorine is handled and used in large quantities. 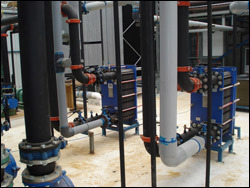 The chlorine leak absorption system is highly useful when chlorine leaks from the tonner valves due to total break down of chlorine valve or any puncture on the wall of the tonner. The system designed and supplied by us consist of gas chamber, blower, absorption tower, alkali tank and recirculating pump with all the required ducting piping and fittings. The system is designed to absorb a total leakage of 1,000 Kgs or more of chlorine leak. The system can be offered with complete room evacuation or spot evacuation in and around the tonner area. The Chlorine gas detection system consists of a control unit and a sensor. The Sensor mounted remotely senses the gas present in the room, which is indicated on the panel. Apart from the audio visual alarm present in the panel, there is a potential free contact which can be used to trigger a remote alarm or actuate the exhaust fan. Vacuum Auto Changeover Module is provided in Gas Chlorinators, to have continuous gas flow without any interruption. Normally, One Vacuum Regulator is mounted on each one of the two cylinders or Tonners. The outlet pipes from these Vacuum Regulators are connected to either side of the Auto Changeover Module. The outlet from the Auto Changeover Module is connected to Injector through a Rotameter and Flow Control Valve assembly. When the Injector is switched ON, Chlorine from one of the tonners flows through the Auto Changeover Module. Once the operating tonners become empty, then Vacuum is developed inside the Auto Changeover Module and activates the toggle switch assembly which changes over to the other filled tonner. Electrical Auto Changeover Module is provided in Gas Chlorinators, to have continuous gas flow without any interruption. It consists of Pressure Sensor, Motorized Valve, and Control Panel etc. There are two Manifolds each connected to one or a battery of filled tonners. When the system is started, one manifold will allow the gas to flow out from a tonner. As soon as the working tonner gets empty the pressure switch provided on the gas line will sense 'the no chlorine' condition and it will energise the motorized valve to open the standby manifold. If both Manifold are empty then the Control Panel will give an 'audio visual alarm'. The Valves on the Manifold can also be opened manually, by passing the Auto mode. We, VJIKKS ENGG POWER (M) SDN BHD ,progressing aggressively as a One Stop Engineering Solution Company, supply Submersible Pump Cables from a No. 1 Manufacturer of PVC/Rubber Insulated flexible Copper Cables in INDIA and exporting around the world with 40 years of continued experiments and innovations in this field make the cables an unmatched quality product compared to any international manufacturer. Our manufacturer is a primary O.E.M Cable supplier for all leading Indian Submersible Pump Brands without any notable competitions. Our manufacturer is an ISO 9001 : 2008 Certified manufacturer by BVQI for Quality Management System and the products are CE marked. For your Water Pump / Dewatering Pump / Water Project / Drinking Water Plant / Mine Dewatering /Drilling Rigs (off/on shore) applications our Flexible Copper Cable with PVC/Rubber Sheath Multi core/Single core are available in International Standard as well as Customize requirement. PVC Copper Cables are made from Virgin PVC manufactured in their own PVC Beans producing plant, to provide best quality products. Rubber Copper Cable are made from Best Quality Rubber. EPR/NBR Range is also available. Drin Cable Lead-Free Cables for Drinking Water Plant / Municipal Drinking Water Supply Project, Water Tank. Customize Cable as per Customer/Project/OEM product require customize requirement can serve. Indirect heat exchanger, where both media are separated by a wall through which heat is transferred. Indirect heat exchangers are available in several main types: Plate ,Shell, Tube, Spiral etc. In most cases the plate type is the most efficient heat exchanger. We supply Plate Heat Exchangers from a reputable manufacturer. With a plate type heat exchanger, the heat penetrates the surface, which separates the hot medium from the cold one very easily. It is therefore possible to heat or cool fluids or gases which have minimal energy levels. One of the very efficient heat exchangers is the plate heat exchanger. It is composed of multiple, thin, slightly-separated plates that have very large surface areas and fluid flow passages for heat transfer. This stacked-plate arrangement can be more effective, in a given space, than the shell and tube heat exchanger. Advances in gasket and brazing technology have made the plate type heat exchanger increasingly practical. In HVAC applications, large heat exchangers of this type are called plate-and-frame; when used in open loops, these heat exchangers are normally of the gasketed type to allow periodic disassembly, cleaning, and inspection. Thin material for the heat transfer surface - this gives optimum heat transfer, since the heat only has to penetrate thin material. High turbulence in the medium –this gives a higher convection, which results in efficient heat transfer between the media. The high turbulence also gives a self cleaning effect. Therefore, when compared to the traditional shell and tube heat exchanger, the fouling of the heat transfer surfaces is considerably reduced. This means that the plate heat exchanger can remain in service far longer between cleaning intervals. Flexibility - the plate heat exchanger consists of a framework containing several heat transfer plates. It can easily be extended to increase capacity. Variable thermal length - most of the plate heat exchangers manufactured by us are available with two different pressing patterns. When the plate has a narrow pattern, the pressure drop is higher and the heat exchanger is more effective. When the plate has a wide pattern, the pressure drop is smaller and the heat transfer coefficient is accordingly somewhat smaller. We can design, manufacture, supply, install, test and commission Plate Heat Exchangers made out of SS and Titanium. We, VJIKKS ENGG POWER (M) SDN BHD ,progressing aggressively as a One Stop Engineering Solution Company, supply Conveyor Belts from a No. 1 Manufacturer of Conveyor Belts in INDIA and exporting around the world. The conveyor belts manufactured are up to 2000 mm width and in various grades conforming to international standards. Conveyor belts particularly suited to Wood related industries, for various applications from conveying light weight wood chips to the heavy belt that withstands the impact of tree logs. This belt has been designed to slow down Log deck movement by absorbing high speed of logs coming out of sizing machines and to simultaneously change the direction of the log. These Belts are made with a unique, soft wear resistant cover with non marking and high traction properties. 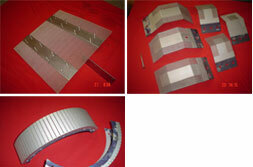 We offer these belts with bare back plies for easy sliding on metal surface. For providing higher traction, we also supply this belt with a proprietory, special moulded profile for heavier duty applications. These belts are light weight, supple, 3 ply belts designed to work with small diameter pulleys. These belts have a bare back construction. Cover grades have excellent oil and weather resistant properties, to prevent oil swelling associated with carrying wood / chips with content of Pine sap or Terpene oil. These belts are supplied in non marking compounds or in black covers, depending on client preference. These belts have studs on the surface to prevent slide back of wood chips, barks on high inclined conveyors. Belts are normally 3 ply - 4 ply construction, having either bare back or having bottom covers. These belts are moderately oil resistant and black in colour. The conveyor belts manufactured are up to 2000 mm width and in various grades conforming to international standards. In Coal Fired Power Plants ,one of the main hazards to which a conveyor system is prone to is Fire. Since general purpose conveyor belts are combustible, in certain areas which are exposed to fire risk, we recommend the use of fire resistant belts. The effect of a fire entails a safety hazard for the personnel as well as potential financial loss caused due to damage to the installation and of course substantial production loss which follows any such breakdown. With the advancement in technology, it is possible to impart properties to conveyor belts so that in fact the propagation of the fire is arrested or limited at the source. This is done by using a combination of polymers, chemicals and additives which contribute to improving the fire retardant property of the conveyor belt. This can often be achieved without compromising the wear life of the conveyor belt as well. In order to cater to varying levels of fire resistance in line with various domestic and international standards, we supply a range of fire resistant belts . 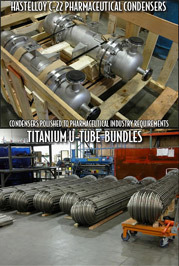 This range includes belts suited for underground use and specialized belts with low smoke and toxicity. Belts with added feature of Heat and /or Oil Resistant property are also available on request. To suit to the needs of Packing Industries, belt is specially designed for transporting light weight goods, either in inclined or in horizontal planes. These belts are designed to transport either fragile material or packed goods, such as, glass, papers, bags, boxes or cartons etc. The deep impression top cover on the belt provides thousands of flexible gripping; these gripping generate the relief effect, absorbing any vibrations and impacts exerted on the materials and simultaneously prevents the material from slipping on high inclined conveyors. The belts are light in weight, move on either slider bed or on idler rollers. For slider beds, we manufacture these belts with our special bare back fabric construction. Special care is taken to ensure that there is no “strike through�� of rubber on the bare side. These belts are suitable for Packing industry, bagging plants , Food packaging industry ,Fragile goods manufacturing / packing industries. However our belts are not suitable for conveying goods where the angle of incline is more than 35 degrees. Also conveying of sticky material and powder is not recommended. 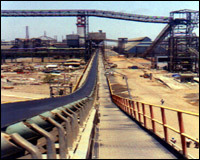 Conveyor belts particularly suited to Cement industries, where conveyor systems having inclined angles greater than 18 degrees, the material tends to roll back. To counter this, the conventional approach is to increase the speed of the conveyors. But, this approach will result in increased energy consumption. With our experience in tackling problems related to high inclines, we supply a specially developed diverse range of Chevron and other profile belts. The belts have specially been designed with wear resistant covers and cleats to provide a high wear life. The special carcass design enables the frequent flexing these belts undergo in usage. We offer a wide range of different cleat designs / patterns, depending upon the type of material to be conveyed. The height of the cleat depends upon the lump size of the material to be conveyed and the angle of incline. 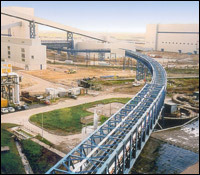 These belts are used for Crushers, including mobile for stone aggregate handling, limestone conveying in cement plants, scrap handling, wood chips. Common Widths : Available in Different Widths of Chevron Belt. Sodium Hypochlorite is a powerful biocide and oxidizing agent that has been widely used in seawater cooling system to avoid the biofouling by marine organisms such as barnacles, mollusca, byrozoa, and sponges. They will lodge and grow at sea water intake structures, bar racks and screens, tunnel walls and condenser pipes. It results in reduced seawater flow rate and heat exchanger capability, corrosion of condenser pipes and metallic surfaces in Power plants. The continuous injection of Sodium Hypochlorite solution at sea water intake with the concentration of 2 to 3 ppm will ensure the complete control of bio fouling. The Sodium Hypochlorite solution is produced by Electrochlorinators in which Electrolyzers made of MMO ( Mixed Metal Oxide) coated DSA Titanium Anodes and Cathodes are the most important equipment. M/s. Siemens, [US Filters, Chloropac, Sanichlor, OSEC, Seapac, Electrocatalytic]. M/s. Charles Thompson Limited, UK. We are ISO 9000 certified company. 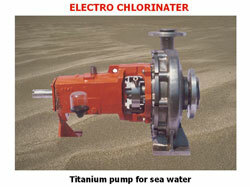 We manufacture Electrochlorinators as per ASME standards. We use WPS & QAP, approved by M/s. Lloyds, M/s. TUV. We can do designing ,engineering and development and fabrication of any product made out of precious, noble and exotic metals TITANIUM, TANTALUM, NIOBIUM, ZIRCONIUM, NICKEL, HASTELLOY, MONEL, INCONEL, X-750, PLATINUM, RUTHENIUM, IRIDIUM, PALLADIUM and its alloys. ICCP ( Impressed Current Cathodic Protection) is a very popular, effective and proven method of Cathodic Protection implemented for many applications. We can manufacture any shape of MMO coated titanium anodes, Platinised titanium anodes, Platinised niobium anodes or their copper cored with platinum plated surface which are used in ICCP for injection of protection current to protect the designated object from the harmful corrosion potential. Industries where corrosive chemicals are handled, very often causes heavy wear of the equipment used, resulting in damage to the equipment, lower reliability, production losses and lower capacity utilisation. As a Malaysian company representing Carborundum Universal Limited, India, one of the leaders in Industrial Ceramics, we offer alumina ceramics for corrosive fluid handling. We bring to you Alumina ceramics with 99.5% purity (which are highly corrosion resistant) for various pump mechanical seal applications. Our `t�� type inserts are resistant to highly corrosive acids and alkalis except phosphoric acid and hydrofluoric acids. 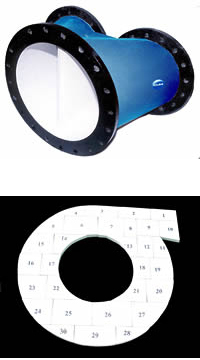 We can manufacture the seal part to the maximum diameter up to 200mm. Our shaft protection sleeves are used by major pump manufacturers and every part can be made to customer's individual requirements. In the transport and control of aggressive fluids, ceramic components provide exceptional resistance to corrosion, mechanical erosion, and abrasion while maintaining their superior surface finish and fit. Ceramic structures of controlled porosity are now finding application in a wide variety of filtration processes. 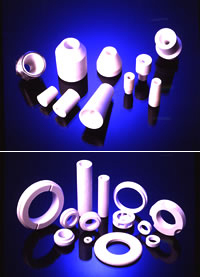 Ceramic Plungers are the right choice for most saltwater, chemical and metering applications. CUMI's specially formulated grades of ceramic allow a standard 0.8 microns Ra surface finish which extends packing life dramatically. Industries like Ceramic tile Industry where bulk material movement involving sliding, very often causes heavy wear of the equipment used, resulting in damage to the equipment, lower reliability, production losses and lower capacity utilisation. As a Malaysian company representing Carborundum Universal Limited, India, one of the leaders in Industrial Ceramics, we offer ceramic wear protection solutions for ceramics tile industries. We supply grinding media and ball mill liners to the ceramics tile industries. High hardness ensures prolonged resistance to chipping and cracking. Long term benefits are attractive with CUMITUFF media as it is a cost effective alternative to conventional media. Media replacement and make-up charge levels drop significantly with the use of CUMITUFF Alumina Ceramic media. CUMI offers grinding media of size less than 6 mm made by a unique pelletisation process for ultra fine grinding requirements such as in the paint industry. Typical sand mill users can benefit from the use of CUMITUFF Mini-Media by virtue of its non-contaminating characteristics. Using CUMITUFF Mill Liners operating times can be achieved higher than conventional mill linings by 30% depending upon properties of material being ground. Combination of CUMITUFF grinding media and mill liners will effectively solve your grinding problems. In a nutshell our products and solutions are First World Products and Solutions at Third World Price. Industries like steel Industry where bulk material movement involving sliding, very often causes heavy wear of the equipment used, resulting in damage to the equipment, lower reliability, production losses and lower capacity utilisation. As a Malaysian company representing Carborundum Universal Limited, India, one of the leaders in Industrial Ceramics, we offer ceramic wear protection solutions for steel industry. Industries like Power Generation Industry where bulk material movement involving sliding, very often causes heavy wear of the equipment used, resulting in damage to the equipment, lower reliability, production losses and lower capacity utilisation. As a Malaysian company representing Carborundum Universal Limited, India, one of the leaders in Industrial Ceramics, we offer ceramic wear protection solutions for coal fired power plants. Our expertise is in manufacturing and supplying pre- engineered wear resistant tiles and ready to fit pre-fabricated lined equipment. We use 3D modelling to ensure a good fit for the contours. 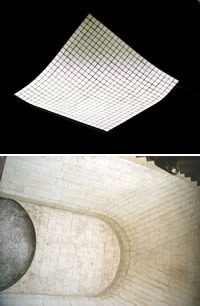 We manufacture weldable and pastable alumina ceramic tiles that can be bonded onto the surface. As a Malaysian company representing Carborundum Universal Limited, India, one of the leaders in Industrial Ceramics, we offer ceramic wear protection solutions for the coal washeries in coal fired power plants. Industries like Cement Industry where bulk material movement involving sliding, very often causes heavy wear of the equipment used, resulting in damage to the equipment, lower reliability, production losses and lower capacity utilisation. As a Malaysian company representing Carborundum Universal Limited, India, one of the leaders in Industrial Ceramics, we offer ceramic wear protection solutions for cement plants. The function of a burner is to ignite and burn the fuel by efficiently and completely mixing it with combustion air in the furnace. Prior to the invention of High Energy Arc Igniter, a pilot burner smaller than the main burner usually ignited by electric spark for a proven ignition energy source required to light off the main oil burner. High Energy Arc Igniters are now being applied to all new modern burners. These Igniters eliminate the use of pilot gas igniter by directly igniting the oil with low voltage, high amperage spark. High energy can be provided with less weight, lighter wire and greater portability by using a high voltage capacitor-discharge system. A large-value capacitor stores energy during the arming sequence, releasing it in a fraction of a second when it is switched on. To use the energy efficiently, the igniter must be designed for high voltage. We have developed various igniters for all types of burners. 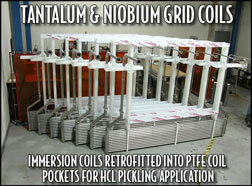 Depending upon the customer requirement, we can supply a suitable High Energy Arc Igniter. Our HEA Igniters are very efficient, light weight, compact design and needs less space. Our Platinised anodes can be fabricated of any shape and with any micron thickness of Platinum. Our Platinised anodes are of First World Products at Third World Price. Our Tantalum Products are ideally suited for reboiling, preheating and condensing of nitric acid, hydrochloric acid, bromic acid, sulphuric acid and combinations of these acids with any other chemicals like aqua regia. Our Tantalum products are First World Products at Third World Price. The continuous injection of Sodium Hypochlorite solution at sea water intake with the concentration of 2 to 3 ppm will ensure the complete control of bio fouling. 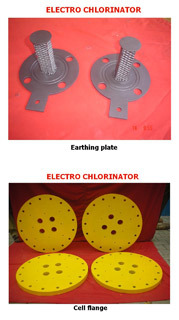 The Sodium Hypochlorite solution is produced by Electrochlorinators in which Electrolyzers made of MMO ( Mixed Metal Oxide) coated DSA Titanium Anodes and Cathodes are the most important equipment. [US Filters, Chloropac, Sanichlor, OSEC, Seapac, Electrocatalytic]. 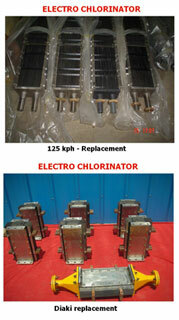 We manufacture Electrochlorinators and its spares as per ASME standards. We can fabricate Grounding probes of any shape for any type of Electrolysers, Grounding rings of any shape for the Electromagnetic flow meters. These Grounding probes and rings are coated with MMO coating. 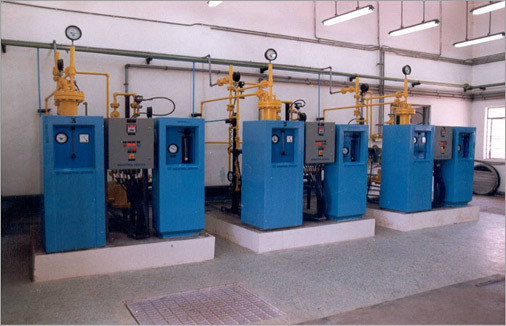 Our pumps are ideally suited for chemical process applications where nitric acid, hydrochloric acid, bromic acid, sulphuric acid and combinations of these acids with any other chemicals like aqua regia or corrosive chemicals handling are used. Our pumps made out of Exotic metals are First World Products at Third World Price. Normally in an oil-free compressor, the air is compressed entirely through the action of the screws, without the assistance of an oil seal and that too on multi stage. But, our oil –free compressors are piston type and that too Single stage. Piston and piston rod form a single rigid unit. By using this type of construction there develops beside the lifting action a tilting motion. To compensate for this the compact piston is fitted with a special seal element. Lamellar valves made of high-grade spring steel ensure a constant performance. Manufactured to the highest tolerances and sealed for life, completely maintenance free ball bearings with double RS seal. Two fans built into the motor and crankcase produce a high level of cooling air, maintaining a low running temperature creating the condition for 100% continuous operation at 7-bar pressure. Even with an ambient temperature up to 40 °C. We can supply oil free compressors of highest standards for any applications. We have readily made compressors of various capacity and we can also Engineer and supply according to the customer’s requirement. Compressors for various different voltage levels, frequencies and also DC voltage. Different protection classes on request. Sound-pressure level measured according to ISO 2151 and ISO 3744. Cathodic protection is an electrochemical process which halts the corrosion (natural reaction) of metals in a particular environment, by superimposing an electrochemical cell more powerful than the corrosion cell. Sacrificial Anodes are fitted or bonded to the metal to be protected which in turn, as it has a greater electrical potential than the anode material, becomes cathodic and causes the anode to sacrifice itself. In a correctly installed Cathodic Protection System the only corrosion occurs to the sacrificial anode which is replaceable. The number and size of anodes is determined by the type of material and the surface area being protected. In a simpler explanation we can say that an anode attached to a metal object, such as a boat or underground tank, inhibits the object's corrosion. The anode is electrolytically decomposed while the object remains free of damage. We can manufacture and supply die cast zinc, aluminum, and magnesium sacrificial anodes which provide low cost cathodic protection of ocean-going vessels, structures and equipment constructed of iron, steel, aluminum, magnesium, and other metals. Our anodes are pressure diecast and manufactured to strict quality standards through an ISO 9001 Quality Management System. Military Alloy Specification and is chemically tested regularly in our in-house labs to ensure consistency. Poorly manufactured anodes may contain high levels of impurities such as iron, which might leave your asset unprotected. Air Operated Double Diaphragm Pump (AODD) is double pumps in one, with two chambers filled and emptied by drawing liquid through a common inlet and discharged through a common outlet. The diaphragm in each chamber is connected by a common shaft so that they move backwards and forwards together. Compressed air is directed by the air valve alternatively behind each diaphragm to power discharge strokes. Pump speed and there fore fluid flow rate can be infinitely controlled by increasing or decreasing air pressure and or volume. Standard AODD pumps are 1:1 ratio so that maximum outlet pressure never exceed air supply pressure. 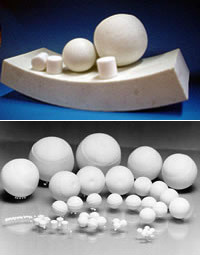 Abrasives like Clay slip, titanium dioxide; All mineral and organic acids; Cement and Mortar; Cosmetics like Creams, emulsions, detergents; Ceramics like Slip glazes and clay; Mud, grout and lubricants from Drilling Operation; Soft drinks, spirits, beer, wine, milk, Inks and Dyes like printing inks, driers, dyes, sixes and solvents; Liquid and semi solid foods, flavourings; Oils like Petrol, diesel, hydraulic and cutting oils, lube oils , animal and vegetable oils and greases. ; Pulps like paper ,wood ; Resins like Natural and synthetics, water and solvent based, monomeric and polymeric plastics; Sludge and waste like sewage, effluents, coal and lime slurry; Solvents like Aromatic and aliphatics, ketones, aldehydes, esters and chlorinated hydrocarbons, de icing fluids; Water of all types; Timber preservatives like creosote, turpentine, copper napthenate; Paint like emulsions, latexes, pigments, solvents, resins, thinners; Phramaceuticals in liquid, creams and compounds form; Plating industry liquids like Aggressive acids,salts, sludge and effluents; Rubber of Natural and Synthetic form. No seal, No leakage,No motor,No fire,No rotation,No charging. Less wear and tear, Self priming, No foot valve needed, Pump can run dry. Variable flow with the same pump, Stop automatic on closing of discharge valve. Light weight,handy in use ,can be submerged easily. Less stock of spare parts. No skilled person needed to operate or repair the pump. Can also be used as metering pump with accuracy upto 3-5%. In a nutshell it is very simple and versatile pump as a First World Product at Third World Price. 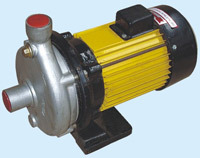 In these Drum Pumps, a pump tube is connected to motor by means of self aligning coupling. The motor transmits power through coupling to the drive shaft of pump which is well supported by TEFLON Bearing. The impeller is mounted at the foot piece of the pump tube and is always immersed in the liquid which assures self priming. The Drum Pump empties the drum to residue of 1 Liter Self Priming and also self draining on completion. No welding is involved in any part of pump tubes. Complete strip down is possible with least number of tools. Variable speed drive with in built control valve. Suitable for safe operation in flammable environments. Automatically cools down due to expansion of compressed air. Air requirement is 18cfm at 3- 6 bar. Air inlet size ¼��. As sparking or fusing is not possible, Air Motor offers explosion protection without any additional cost. This type of Drum Pumps are designed as progressing Cavity Type Screw Pumps for pumping medium to high viscous liquids. The progressing cavity design ensures smooth and non pulsating flow and ideal for the gentle transfer of liquids. Pumping action starts the moment the Rotor turns. Liquid enters the pump suction under pressure as the Rotor turns within the Stator, thus forming tightly sealed cavities which moves the liquid towards the outlet .Moreover the liquid acts as a lubricant between Rotor and Stator. Available in SS316 / 304 material. Maximum flow rate of 60kg/min with a discharge pressure up to 8bar. Can generate differential head up to 80meters for low viscous liquids. The flow rate is approximately proportional to the speed. However, pumping pressure does not depend upon the speed. Rotor is made of SS316. In a nutshell it is very simple pump as a First World Product at Third World Price. Our Peristaltic Transfer or Hose or Tube Pumps are available in three different series to suit the different customer requirements. Two or three rotating rollers gradually compress a tube forcing liquid through the tube just ahead of each roller The tube returns to its original shape after rollers pass so it can fill with more liquid again. No seal, No valves, Self priming, Pump can run dry. Pumped fluid always remains inside the tube, Time saving in C.I.P applications. Reverse flow by reversing motor, Pump mixed phases, Minimum shear. Fragile and sensitive fluids: Emulsions, fruit salads, sparkling wines, tomatoes, purees, dairy products, antifoaming agents, whole grapes, fruit juices. Compound fluids: Butchery waste, additive metering, paper pulp, grape marc, animal feeds, minced fruit, polymers, sugar beet and potato processing waste. Abrasive and corrosive fluids: Bentonite, mud and sediment, enamels, pigments, lime wash, casting slip, plaster mortar, concrete, fertilizers, manure slurry. Non-pollutable or pollutant fluids: Rubber latex, food products. Polypropylene (PP), also known as polypropene, is a thermoplastic polymer used in a wide variety of applications. it is rugged and unusually resistant to many chemical solvents, bases and acids. Polypropylene is normally tough and flexible, Polypropylene has good resistance to fatigue. 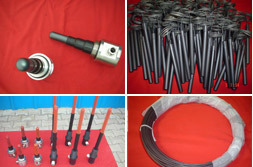 All pumps, shaft are available with sleeves of different materials compatible with the liquid handled. All pumps are available with externally mounted balanced mechanical seal or Teflon Gland Packing or internal mechanical seal with elastomer bellows. Ploypropylene Volute and impellers are injection moulded which provide smooth hydraulic passage. Injection moulded Polypropylene components provides higher strength Higher efficiency and better surface finish. 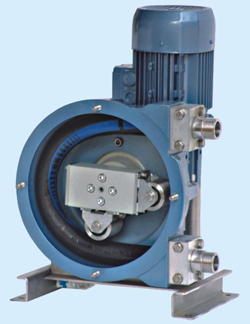 Non clog impeller to handle solids ( up to 35mm solids without strainer). With float switch to protect against dry run, auto start and stop. Float also available with 3 phase. with class “F�� insulation and IP68 protection. In a nutshell it is a very simple pump as a First World Product at Third World Price. Our Sealless Magnetic Driven Pumps do not have conventional mechanical seals as pump chamber is shielded by casing and impeller is operated by magnets. Hence these pumps are totally leak proof. These sealless pumps are ideal for transfer of chemicals like acids etc., since they are leak proof and made from polypropylene, totally eliminating contamination of liquid transferred. Capacity range : 5LPM to 500LPM. Head range : Up to 1 Meter. Electrical Motor : Up to 5 HP. 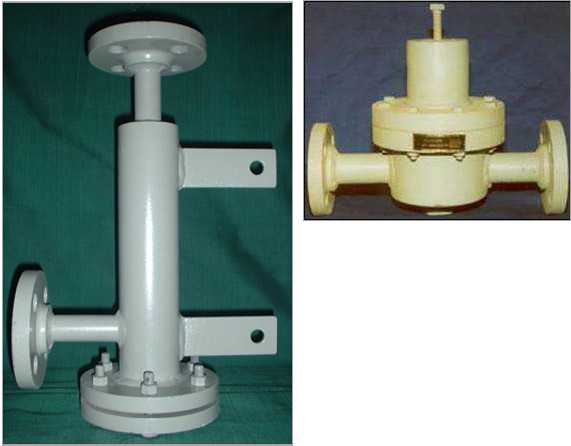 Front casing, Rear Casing & Impeller are in glass filled polypropylene / PVDF / SS. Shaft is made of ceramic & guided in carbon filled Teflon bush. AMM, Chloride, Cupric Cyanide, Ethanol, Ferrous, Sulphate, Potassium Di- Chromate, Sodium Chloride, Petrol, Kerosene, milk, alcohol and many more. Our Self Priming Pumps with its Volute Casing, Open Turbine type impeller & back plate is made from SS-316 Investment casting. Capacity range : 7LPM to 125LPM. Head range : 2 to 30Meter. Electrical Motor : 0.5HP to 2.0 HP. Sealing arrangement : Ceramic & Graphite with Vitlon or Teflon Elastomer. Barium Cyanide, Barium Sulphate, Carbon Di Sulphate, Hexane, Hydrogen Fluoride Platting Sol, Copper & Iron and many more. Wide range of application in various industries such as alimentary, petro- chemical, Textile, Pharmaceutical, Depuration. For pumping inflammable liquids with flame proof motors. Capacity range : 5LPM to 270LPM. Head range : 2 to 18Meter. 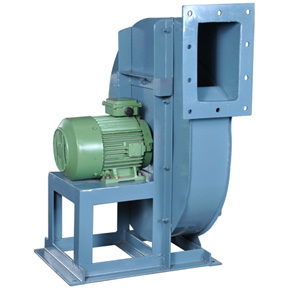 This pump can handle soft solids, small cloth particles. Butter, Butter Milk, Fatty Acid, Hydrogen Sulphate ,Polluted Water and many more. Ideal solution to pumping problems in depuration plants with polluted water, for textile industries, food, petrochemicals and Galvanize industries..
VJIKKS ENGG POWER (M) SDN BHD offers Single inlet Single width/ Double inlet Double Width fans from capacity 60M3/Hr to 250000 M3/Hr with pressure range from 60 mmwg to 1500 mmwg for single inlet single width and 1000 mmwg to 2000 mmwg for multi stage fan to suit customer duty conditions at optimum efficiency to satisfy industrial needs. We offer wider range of material of construction like mild steel, SS304/SS316, PP/FRP, MS with rubber lining and can be coated with special corrosion-resistant paint, epoxy, heat resistant paints. Fan orientation from the following chart - ………..
Are you paying heftily for your plant process water consumption? Do you want to get the water consumption reduced? Do you want to get the Fact Finding inspection done by 25 years Power Plant experienced personnel? Do you want to know the symptoms of rotor winding fault? Do you want to know how to prolong the designed life of the Electrolysers? Do you want to know how to easily identify the Electrolyser approaching its life time? Do you want to know how to identify the individual weak cells in a battery bank? Do you want to know how to escape from the replacement of the entire battery bank ? Do you want to know how not to get carried away by the manufacturers? Do you want to know the well tried and well tested maintenance practice? Do you want to get the very practical procedures prepared ? Do you want to get such procedures on hand to avoid delays in your plant start up? Are you sure that the protection settings set by the OEM’s Commissioning Engineer suitable after a few years of plant operation or after going through a few insurance audits? Analysis, review and recommendations in plant electrical system switching, isolations, normalisations. Are you sure that the electrical switching, isolation and normalization what you are doing are safe? Do you want to get those actions reviewed by a 12 years experienced Resident Competent Electrical Engineer ( 275KV)? Are you sure that the technology what you are using to disinfect the water is the latest safe and environmental friendly technology? Do you want to get the latest, safe, environmental friendly and ultimately cheaper technology implemented? Are you facing problem in analysing and trouble shooting teething problems in special system and equipment which affect your plant reliability? Do you want to get the very complicated and expensive process equipment like Tantalum Bayonet Heat Exchanger or Coils repaired at your site or at our factory in fractional cost ? Do you want to get rid off with high maintenance Backwash filters, frequent cleaning of Heat exchangers, frequent cleaning of Electrolysers? Do you want to get an all encompassing program of develop support and set up services ? Do you want to get the support services in reviewing plant effectiveness and performance from an O&M perspective ? Do you want to get the support services to improve the self �� operator’s O&M performance by providing O&M oversight or “technology transfer�� services? Do you want to get the services to review and provide recommendations on plant/machinery plans and drawings with respect to their impact on plant operations and maintenance?